A true dual axle position allows for repositioning the 24" rear wheels and 8" casters for adult and hemi set-to-floor heights. 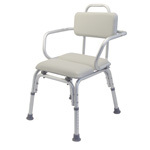 Offset permanent arms offer full seat width up to 20". Back height 16" fixed. 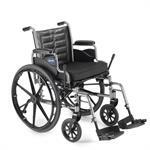 Seat depth 16" standard.14-gauge crossbraces add strength and durability. Dual axle positions allow variation of seat-to-floor heights. Durable, low-maintenance, triple chrome-plated, carbon steel frame is long-lasting. Urethane rear tires, mounted on "No Flex" wheels, offer superior performance. 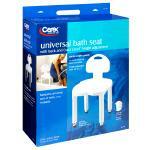 Product weight: 36 lbs., Weight capacity: 250 lbs. Lifetime warranty of frame on crossbraces. Midnight blue upholstery. 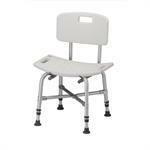 Seat: 18"W x 16"D. INVTREX28P. Does not include cushion and brake extension.